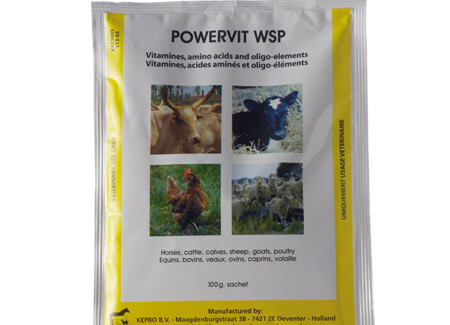 Powervit wsp is a scientifically concentrated, stabilised powder with multivitamins like the fat-soluble A, D, E and K and water-soluble vitamins of the B and C group; the essential amino acids methionine and lysine; and various essential minerals and trace elements like iron, copper, zinc, manganese, cobalt and iodide. 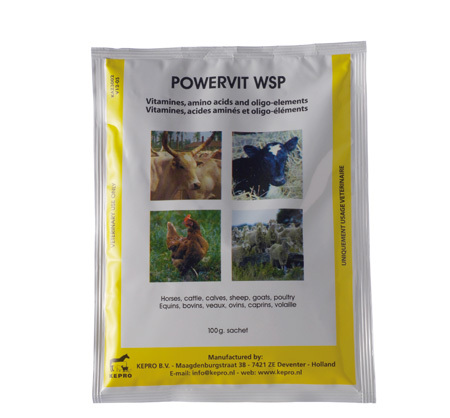 Powervit wsp is indicated for stressful periods during the first days of life, vaccination, diseases, excessive changes in temperature, transfer to a new hen house, culling, transport etc. Post-treatment use after a Coccidiosis treatment; worm, bacterial and virus infections. Convalescence: during off-feed period and during deficiency or nutritional diseases. – Higher egg production peak level. – Maintenance of high production level throughout the laying period. per 400 litres according to individual requirements. Mixed through feed: 500 – 1,000 g per 1,000 kg of feed. Calves : 0.5 – 1 g per animal daily, during 7 days. Pigs : 100 g per 200 – 400 litres of drinking water daily, during 3 – 5 days. Mixed with feed: 500 – 1000 g per 1,000 kg of feed. Dosing depends on the individual requirements. Sheep, goats : 0.5 g per animal daily, during 7 days.